I love a good bowl of soup. I don’t know what it is about soup but it is so satisfying and better yet, it is low in calories! Just can’t beat a combination like that. This soup is so easy to put together and it is family approved! However, there is a word of caution here, if you have people in your family with sensitive mouths then this soup may be too hot for them. If you are a seasoned Texan like I am, then you will enjoy the hotness that this soup brings to your senses. Combine first 4 ingredients in a large saucepan; bring to a boil. Reduce heat, and simmer 5 minutes. Add juice, pepper, shrimp, and tofu to pan; bring to a boil. Cook 2 minutes or until shrimp are almost done. Combine cornstarch and water in a small bowl, stirring until smooth. Add cornstarch mixture to pan; cook 1 minute, stirring constantly with a whisk. Slowly drizzle egg white into pan, stirring constantly. Remove from heat; stir in chili oil and onions. 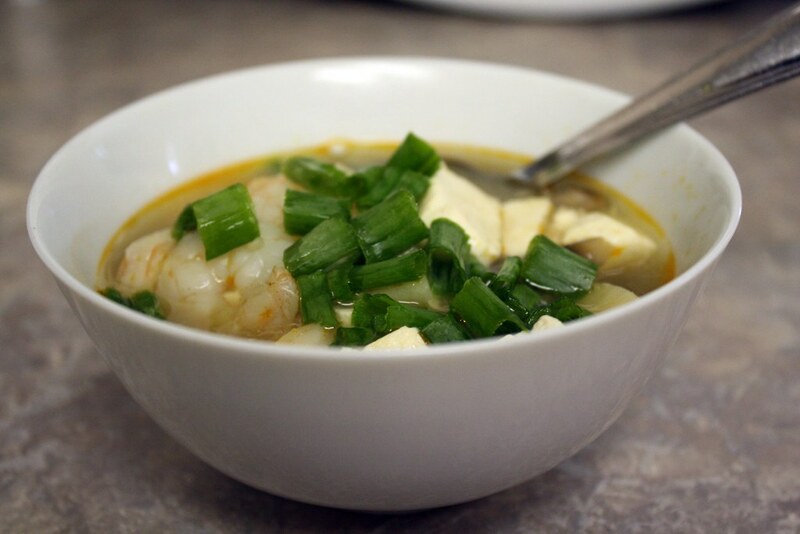 Posted on April 5, 2011 December 7, 2011 by cookingwithpizazzPosted in Fish/Seafood, SoupTagged Oriental, Shrimp, Soup.